The main campus of the University of Maryland at College Park was founded in 1856, originally chartered as the Maryland Agricultural College. The older buildings on campus feature Georgian architecture constructed of brick with classic white columns, while the newer structures are a more modern style. 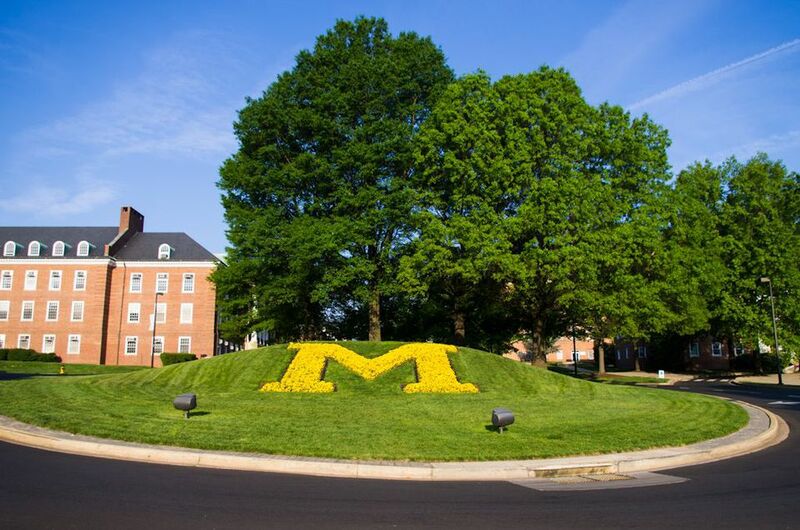 Enjoy the following photos and get a glimpse of the University of Maryland and its amenities. The traffic circle on Campus Drive (pictured above) welcomes visitors with a letter "M". Flowers are planted in the "M" twice a year, once in the fall with pansies and again in the spring with annuals, usually vodka begonias. The "M" was created in 1976 to commemorate the bicentennial of the United States. The University of Maryland Mall is a 16.28-acre green space located in the heart of the campus that extends from the McKeldin Library to the administrative buildings on the east side of the campus. The Mall is a popular gathering space for students, especially during the warm weather months. A fountain and sidewalks were added to the space in 1990. The student union building at the University of Maryland was built in 1954. It was named for Adele H. Stamp, dean of women (1922-1960), in 1983. The Adele H. Stamp Student Union provides a center for entertainment, food, shops and services, student organizations, and administrative offices. The Clarice Smith Performing Arts Center hosts approximately 1,000 events each year including music and dance performances, workshops, lectures, dialogues and other events featuring students as well as visiting artists from around the world. The Arts Center is the largest single building ever constructed by the State of Maryland. It includes six performance venues: The Morris & Gwendolyn Cafritz Foundation Theatre, The Dance Theatre, The Elsie & Marvin Dekelboum Concert Hall, The Joseph & Alma Gildenhorn Recital Hall, The Ina & Jack Kay Theatre, and the Kogod Theatre. H. J. Patterson Hall, a beautiful historic building, located in the center of the University of Maryland campus, is home to laboratories and offices for College of Agriculture and Natural Resources. The building houses one of the biggest collections of soil monoliths (preserved soil profiles) in the ​United States. Testudo is the Diamondback terrapin that serves as the official mascot of the University of Maryland. The original statue, located in front of McKeldin Library, was the gift of the Class of 1933. Students and visitors rub his nose for good luck. Because of the popularity of this tradition, five additional copies of the statue have been installed on campus: outside the Comcast Center, inside the Stamp Student Union, one on either side of the Gossett Football Team House, and outside the Samuel Riggs IV Alumni Center. The University of Maryland Memorial Chapel was dedicated on October 12, 1952, as a living memorial to honor the men and women from the University who lost their lives defending our nation. The building has three chapels: the Main Chapel, the West Chapel, and the Chapel of the Blessed Sacrament. The chapel serves as a venue for a diverse range of events including weddings, concerts, lectures, convocations, and commencements. There are eight sculptures on the University of Maryland campus. This sculpture resembling Stonehenge was created in 1972 by Kenneth Campbell, art professor emeritus, who taught stone carving for fifteen years. The sculpture is located on the Mall next to H. J. Patterson Hall. Cole Field House at the University of Maryland was constructed as the Cole Student Activities Building in 1955 and named for Judge William P. Cole, Jr., Class of 1910 and chairman of the Board of Regents from 1944 to 1956. The building was the home of the University of Maryland basketball teams until it was replaced by Comcast Center in 2002. Today, the facility is used as a soccer practice field and for other special events. McKeldin Library is the main library for the University of Maryland. The building was constructed in 1958 and named for Theodore R. McKeldin, Governor of Maryland, 1951-1959. Fraternity row was constructed between 1914 and 1963. It is now home to houses of 14 of the campus's fraternity and sorority chapters. The Rossborough Inn at the University of Maryland is the oldest building on campus dating back to 1802 when it served as a hotel. Over the years, it has also served as the headquarters for the Agricultural Experiment Station, a dormitory, and the home of the Faculty/Staff Club. The Inn is rumored to be the most haunted building on campus. One of the newest buildings on campus, the Geary F. Eppley Recreation Center opened at the University of Maryland in 1998. The facility includes a track, fitness room, weight room, aerobics room, racquetball and squash courts, two swimming pools, sauna, steam room, locker/shower facilities, and more. The University of Maryland Campus Farm is used primarily for Animal Science undergraduate programs and includes 3 main barns, a riding area, a machine shed, an office building and the Poultry Behavior Research Facility. These facilities were part of the original Animal Science Research Farm dating back to the late 1800s. Shipley Field, the baseball field of the Terrapins (or Terps) is located in the heart of the Maryland campus, in between Byrd Stadium and the Artificial Turf Facility. It is named after legendary coach H. Burton Shipley, who was the Maryland skipper from 1924-1960.